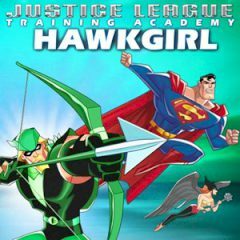 The Hawkgirl should practice a lot to remain useful among the Justice League and its members. Get out on the roof of the building and see how far you can jump using your wings and avoiding the robots. How would you practice, if you were the Hawkgirl? Her trainings are dangerous, but very efficient and she gets satisfaction from every successful fly. Get on the roof of the building and accelerate to get the maximum speed for your jump. Jump and open your wings to fly forward and cover the big distance to set the best record. How far can you fly in one try?